Nico Schulz celebrates his late winner. 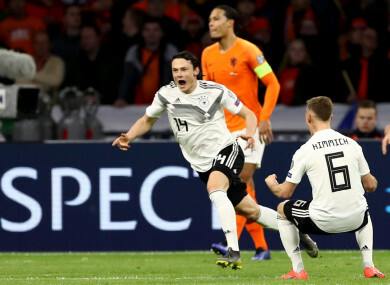 HOFFENHEIM MIDFIELDER NICO Schulz fired Germany to a dramatic 3-2 victory over the Netherlands in their opening Euro 2020 qualifier on Sunday with a 90th-minute winner, lifting the pressure off coach Joachim Löw. It was Germany’s first win in a competitive game since last year’s World Cup, and came after a game in which Löw’s side showed strength and fragility in equal measure. Yet Schulz prodded in a last-gasp winner against the run of play to hand Germany the win. Germany burst out of the blocks and Dutch goalkeeper Jasper Cillessen had to beat away a fierce shot from Serge Gnabry after just two minutes. Email “Schulz's 90th-minute winner seals dramatic late win for Germany over the Netherlands”. Feedback on “Schulz's 90th-minute winner seals dramatic late win for Germany over the Netherlands”.